Looking for an opportunity to own a business that serves phenomenally popular restaurants, and values the importance of having IT technology, and getting involved in the community? We’re always looking for new franchisees, and we’d love to talk about invo future with you. It’s an exciting time to join and grow with invo POS Technologies Company. Ali Darwish opened the company in 2008 and we continue to follow his principles to ensure we build upon our position as a quality leader in the Food and Beverage industry. 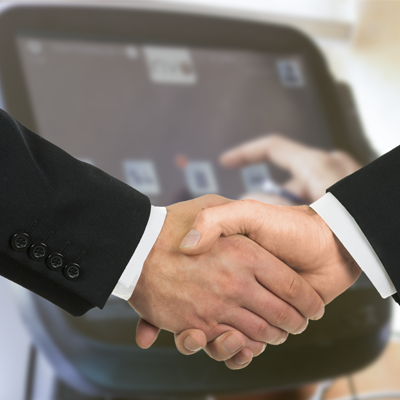 Resellers receive on-going direct support from our skilled operators at the field level. We strive for A-level operations at every restaurant and provide the tools, resources, and training. Initial and on-going manager and crew level training programs focus on what is needed to provide invo total customer experience. The quality assurance department ensures that invo maintains a high level of service through an on-going collecting feedback process. Excited to learn more about invo reselling opportunity? Please, complete and submit our Initial Inquiry Form. If together we seem like a good fit, we’ll contact you to schedule an introductory call. Next, we’ll send you an application package to complete. If your application meets our criteria, we’ll continue getting to know each other better. We will share our Reselling Disclosure Document, invite you to speak with some resellers, and give you a considerable opportunity to explore the business. Finally, we will extend an offer to you to become invo franchisee or reseller. Do you provide software development services?